Mobile Bingo is growing in popularity at a rapid pace since the huge developments in smartphone technology. Believe it or not, sometimes it can be hard to make a deposit on your mobile and can be a very fiddly process. The purpose of PayByTextBingo.com is to source all the websites offering the option to deposit using your phone bill / SMS / Text Message. This is by-far the easiest option for depositing when playing on your mobile. This is a market which is still very young and developing. As such, you will not be able to find a huge selection of mobile bingo sites that will allow you to pay by sms or text message. At PayByTextBingo.com we have taken our time to carefully research each of the mobile bingo providers which will allow you to make a deposit into your account using your phone bill. Each of these websites has been played and tested by our expert staff. If we feel that despite having an incredibly easy payment method, yet the bingo itself is poor then we will let you know. We also strive to look at the terms and conditions to ensure that you will only ever be recommended somewhere which is safe and secure and not out to scam its bingo players. We’d like to think that not only are we a source of different pay by text bingo sites but also a resource and guide that helps you make an informed decision before agreeing to join a particular mobile bingo website. We have tried to cover every available aspect from the software used, the offers available, how each of the different payment methods work and how you can play bingo on particular mobile devices such as your iPhone, HTC or Samsung smartphone. Over £250 worth of free bingo from this brand new comparison site. How Does Pay by SMS / Text Bingo Work? When you to choose to fund your mobile bingo account by sms / text message then the bingo operator will add however much you chose to deposit to your monthly phone bill. This means that whatever you chose to deposit will need to be paid to your mobile phone supplier once you get the bill in for that months use. When you pay by sms / text message you can also use your mobile phone if you’re using pay-as-you-go. But remember, you will need enough funds on your phone to be able to cover the amount you are intending to deposit. Account Using SMS / Text Message? The actual process of making a deposit via sms / text message could not be easier. Firstly, you’ll need to register with a mobile bingo provider that will allow you to deposit by sms / text message. Once you’ve done this you’ll need to head over to your account and click on deposit or cashier. Once you do this you’ll have a list of different payment methods available to you. 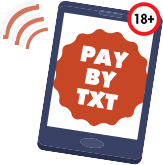 From this list click on ‘pay by text’ or ‘mobile phone bill’ the exact wording will vary depending on which mobile bingo site you’re using. After this you’ll need to select your network and then you’ll be sent a text message to confirm your mobile number. Once this has done, you select how much you wish to deposit and then your account is funded. It is a very simple process and no card details are needed at any stage. There are obvious advantages when it comes to paying by sms / text message to top up your mobile bingo account. The most obvious of these is the convenience. You do not need to pull out your debit or credit card, or worry about filling these details in each time you wish to make a payment. Neither will you need to know your PayPal account number or any other details which will need to be typed into your phone. You just choose to pay by your phone and how much you wish to deposit and that is it. It is incredibly convenient and also very easy. One area we like, which we feels help promote responsible gambling is that you are usually restricted to a relatively small amount each day. The majority of mobile bingo operators who will allow you to deposit by sms / text message will have a daily limit of £30. This means that you are restricted to how much you can spend to fund playing bingo. There are also a number of disadvantages to making a deposit to your mobile bingo account using sms / text message. The first is the lack of choice. There really are not that many bingo operators who offer you the choice to pay by sms / text message. This means if you do not like a particular mobile bingo site then your chance of finding another mobile bingo site using this deposit method is greatly reduced. Another disadvantage is just how easy to make a deposit. Some of you may ask why this is a disadvantage? If you are a player who struggles to control the amount you gamble, then this method makes it so easy to make a deposit that you may be tempted to make a deposit every day. Naturally, you can’t set spending limits as they are set for you, but if you made a deposit each day the costs will soon add up. Naturally, you could end up with a nasty surprise when you get your mobile phone bill at the end of the month! We ask that you therefore play responsibly, and if you feel you have a problem look to use alternative payment methods where you can set smaller daily limits. Our site is to highlight and compare mobile bingo sites allowing you to deposit real money by SMS / Mobile Phone Bill. This is a very convinient way of depositing but extra care should be taken regarding budgeting and making sure you can afford what you spend. If you feel that playing online is becoming addictive or that you are spending more than you can afford then please take a look at the Gamble Aware website. Playing bingo online should be enjoyable and fun and should not add to any stress you may or may not have.